World Boxing Association welterweight titlist Manny Pacquiao has barely started his preparation for his first title defense against challenger Adrien Broner but this doesn’t stop boxing analysts and odds makers alike to install he Filipino ring icon early favorite to keep his crown. 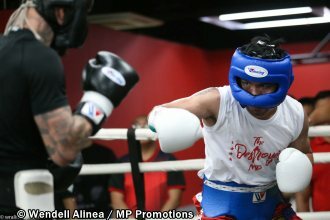 Pacquiao, in fact, had just began the sparring part of his fine-tuning program last Tuesday, but that early earned kudos from his training staff, including chief trainer Buboy Fernandez and conditioning coach Justin Fortune. Paddy Power and Betfair in their November ranking both picked Pacquiao, who will turn 40 on December 17, to win 4/9 while the American pretender a 7/4 underdog. Odds of draw is 20/1. Bovada, on the other hand, as of Novermber 21, saw the eight-division belt-owner a -230 winner with Broner +180. Same with Scott Hastings, who, likewise, expects the father of five with wife, former Sarangani Vice Gov Jinkee, the winner based on Pacquao’s winning his of his last four fights, a record which, he added, could have been 4-0 had it not been for his controversial loss to Australian Jeff Horn. “While Broner is younger than Matthysse and naturally bigger as a welterweight, he'll be an even bigger underdog because Manny has looked solid in 3 of his last 4 bouts, and was dynamic in his most recent scrap,” Cleveland said. BoxRec currently ranks Broner as its No. 8 welterweight while Terence Crawford is No.1, PacMan is No. 2 and Errol Spence sits at No. 3. “Broner will likely need a knockout to win yet he's recorded just 2 in his last 9 fights,” he said. “Couple that with the fact that Pacquiao has a solid chin and is extremely difficult to hit cleanly and it's easy making Manny Pacquiao a -900 favorite over Broner. My Pick: Pacquiao by UD." Photo: Manny Pacquiao begins his sparring last Tuesday in General Santos City, Philippines in preparation for his upcoming fight against Andrien Broner on Jan. 19 in Las Vegas.